Context: Few vegetables that are commonly consumed in India as part of diet have been claimed for their antidiabetic potential. Objective: The present study was aimed at evaluating preventive effects of cucurbit vegetables namely, Coccinia indica and Momordica balsamina belonging to family Cucurbitaceae in diabetic hyperglycemia. Materials and Methods: The fruits of M. balsamina and C. indica were extracted with chloroform and fractionated with hexane to prepare an extract rich in moderately polar components. These extracts were used for evaluating the effect of these cucurbits in nicotinamide/streptozotocin-induced type 2 diabetes. Streptozotocin–nicotinamide-induced diabetic animals were orally treated with chloroform extract of fruits (250 mg/kg BW) given daily for a week separately. Results: Both the extracts reduced fasting blood glucose significantly (P < 0.05 versus diabetic control) when estimated on seventh day of treatments. Pretreatment with fruit extracts for 7 days also blunted the OGTT (oral glucose tolerance test) curve. Results indicated that C. indica and M. balsamina fruits possess beneficial effects in diabetes by lowering elevated blood glucose level. Six cucurbitane-type triterpenoids were isolated from bioactive extracts of C. indica (1-3) and M. balsamina (4-6). The structures of these compounds were elucidated on the basis of spectroscopic data analysis.Conclusion: The study concludes that the inclusion of C. indica and M. balsamina fruits in food can be useful for newly diagnosed diabetic patients or highrisk group of population for glycemic control. The beneficial effects of chloroform extracts of vegetal cucurbits namely C. indica (Ivy gourd) and M. balsamina (Balsam apple) in streptozotocin-nicotinamide (STZ-NA)-induced diabetic rats has been evaluated. The isolation and characterization of six cucurbitacins from bioactive extracts of C. indica (Coccinoside A, B, and C) and M. balsamina (cucurbit-5, 7-dien-3ß-ol, cucurbita-5-en-3ß-ol-3-O-ß-d-glucopyranoside, and cucurbit-5-en-3ß-ol-3-O-ß-d-glucopyranosyl-(4’→1”)-O-ß-d-glucopyranoside) have been reported for the first time. The study concludes that the inclusion of C. indica and M. balsamina fruits in food can be useful for newly diagnosed diabetic patients or high risk group of population for glycemic control. Diabetes mellitus is a serious metabolic illness worldwide. Defect in the carbohydrate metabolism and continuous efforts of physiological systems to correct this imbalance have been reported to pose overexertion on the endocrine system leading to the deterioration of endocrine control. Variation in carbohydrate metabolic enzymes due to deterioration of endocrine control leads to hyperglycemia. Some risk factors associated with diabetes such as elevated plasma glucose concentrations in the fasting state and after an oral glucose load, overweight, and sedentary lifestyle are potentially reversible. At present, most of the diabetes-related research involves drug therapy rather than preventive or nondrug interventions. In a study, incidence of diabetes was reduced by 58% with the lifestyle intervention and 31% by metformin. Few vegetables that are commonly consumed in India as part of diet have been claimed their antidiabetic potential especially those from family Cucurbitaceae. As a part of lifestyle modification, dietary intervention focused on consumption of food plants can be an interesting approach in ameliorating the effects of this metabolic disorder to certain extent. Cucurbitaceae is a family of about 110 genera and 640 species found abundantly in tropics and subtropics. Its members are mostly herbs climbing by tendrils with abundant sap and a very rapid growth. The main genera include Cucurbita (five species), Cucumis (25 species), Citrullus (three species), Luffa (six species), Bryonia (four species), and Momordica (45 species). 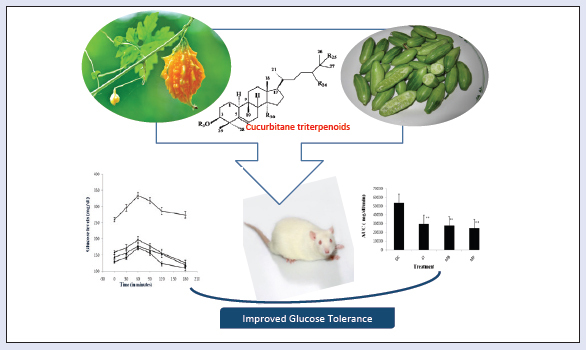 The blood glucose-lowering efficacy of few members of Cucurbitaceae family has been assessed by researchers worldwide as reviewed by us previously. Coccinia indica Wight and Arn. has long been traditionally used in diabetes care., Phytoconstituents reported from C. indica include lupeol, β-amyrin, cucurbitacins, taraxerol, β-carotene,,, steroidalsaponins, flavonoids, pectin, and polyprenol. Momordica balsamina Linn. is a highly reputed medicinal herb used especially in the management of hyperglycemia in diabetes., Phytoconstituents such as momordicin and cucurbitanes,, have been reported earlier from the plants. The current study involves the evaluation of beneficial effects of chloroform extracts of vegetable cucurbits namely C. indica (Ivy gourd) and M. balsamina (Balsam apple) in streptozotocin-nicotinamide (STZ-NA)-induced diabetic rats. In this model, diabetes is induced by administration of STZ-NA combination at low doses., The model is ideal for screening of dietary herbs against moderate hyperglycemia. The article also describes the isolation and characterization of six cucurbitacins from bioactive extracts of C. indica (1-3) and M. balsamina (4-6), being reported for the first time from these plants. Melting points were determined on a Perfit apparatus and are uncorrected. The infrared (IR) spectra were measured in KBr (potassium bromine) pellets on a Bio-Rad FT-IR spectrometer (SpectraLab Scientific Inc. 38 McPherson St. Markham (Greater Toronto Area) Ontario L3R 3V6 Canada North America E-mail: Technical Support: support@spectralabsci.com). Ultraviolet (UV) spectra were obtained in methanol with a Lambda Bio 20 spectrometer (Perkin–Elmer, Rotkreuz, Switzerland). 1H (400MHz), 13C (100MHz), COSY, and DEPT NMR spectra were recorded on Brukerspectrospin spectrometer (Bruker AXS, Karlsruhe, Germany). DMSO-d6 (dimethyl sulfoxide) or CDCl3 (Sigma–Aldrich, Bangalore, India) were used as solvent and TMS (tetramethylsilane) as an internal standard. ESI-MS (electrospray ionization mass spectrometry) analyses were performed on a Waters Q-TOF Premier (Micromass MS Technologies, Manchester, United Kingdom) Mass Spectrometer. Column chromatography separation was carried out on silica gel (60–120mesh; Merck, Mumbai, India). Preparative TLC (thin layer chromatography) was performed on silica gel (Merck, 200–300mesh). Precoated silica gel plates (Silica gel 60 F254; Merck) were used for analytical TLC visualized by exposure to iodine and UV radiations. STZ was obtained from Sigma-Aldrich Chemicals (St. Louis, Missouri, USA). NA was obtained from Central Drug House (P) Ltd., New Delhi (India) and metformin was obtained from Franco–Indian Pharmaceuticals Pvt. Ltd., Mumbai, India. All other chemicals used were of analytical grade from S.D. Fine chemicals, Delhi, India. Fresh fruits of M. balsamina were procured from vegetable market in Moga (Punjab) and C. indica fruits were obtained from local vegetable market in New Delhi, India. The fruits were authenticated by Dr. H.B. Singh, Taxanomist, National Institute of Science Communication and Information Resources (NISCAIR), New Delhi, India. Voucher specimens were deposited in NISCAIR, Delhi. Fruits were sliced, shade dried, and grounded to yield the coarse powder. The powder of dried fruits (2kg each) was defatted with petroleum ether and then extracted with chloroform. The extract was then concentrated under reduced pressure on a Rotavapor (Buchi, Switzerland) to yield a viscous residue (110g for C. indica and 130g for M. balsamina). Male albino Wistar rats (3 months old, 150–200g BW), raised in the animal house of Hamdard University, New Delhi, were used (Animal ethics permission number 173/CPCSEA/755). They were housed in the colony cages (five rats per cage), at ambient temperature and allowed free access to water. Animals were fed with standard rodent diet. Diabetes was induced by STZ-NA combination in overnight fasted rats. STZ was dissolved in 50mM citric acid buffer (pH 4.5) for intraperitoneally administration (45mg/kg BW). NA was dissolved in physiological saline and intraperitoneally administered (110mg/kg BW), 20min before STZ administration. One week later, mildly diabetic rats with fasting blood glucose (FBG) levels at least 150mg/dL were selected for further study. The rats were randomized into four groups comprising of five animals each. Diabetic control rats, received orally 1mL/kg BW vehicle (0.3% CMC (carboxy methyl cellulose) in distilled water). Metformin-treated diabetic rats received metformin daily (15mg/kg BW p.o.) in vehicle 1 week after STZ-NA treatment and continued for 7 days. 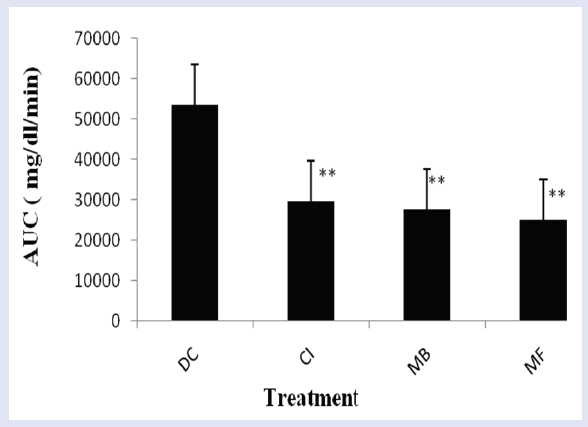 C. indica and M. balsamina treated diabetic rats received chloroform extracts of respective fruits (250mg/kg BW, p.o.) in vehicle, 1 week after STZ-NA treatment and continued daily for 7 days. Blood was withdrawn from tail vein after 0, 3 and 7 days and FBG was measured. Oral glucose tolerance test was performed after overnight fasting of rats on seventh day of treatment. Vehicle (0.3% CMC in distilled water), C. indica fruit extract in vehicle (250mg/kg BW, p.o. ), M. balsamina fruit extract in vehicle (250mg/kg BW, p.o. ), and metformin (15mg/kg BW) were administered orally to respective groups (n=5). Glucose (2g/kg BW, p.o.) was fed to all groups after 60 min of treatment. Blood was withdrawn from the tail vein at 0, 30, 60, 90, 120, and 180min and blood glucose was measured. Blood glucose concentration was estimated using an Accu-Check active (Roche Diagnostics GmbH, Sandhoferstrasse 116, DE-68305 Mannheim, GERMANY, http://www.roche.de/diagnostics/index.htm), based on the glucose oxidase method. Observed data were represented as mean±S.D. For statistical analysis of the data, group means were compared by one-way analysis of variance ANOVA (analysis of variance) followed by Dunnett's test for multiple comparison. A difference in the mean values of P < 0.05 was considered significant statistically. Melting points were determined on a Perfit apparatus and are uncorrected. The IR spectra were measured between 4000 and 650cm–1 in KBr pellets on a Bio-Rad FT-IR spectrometer (Spectra Lab Scientific Inc.). UV spectra were obtained in methanol from 200 to 400nm with a Lambda Bio 20 spectrometer (Perkin–Elmer). 1H (400MHz), 13C (100MHz), COSY, and DEPT NMR spectra were recorded on Bruker spectrospin spectrometer (Bruker AXS) with acquisition and processing parameters as follows: prob hd 5mm, pulprog zg 30, td 65536, SWH 120.230Hz, FIDRES 0.183399Hz, AQ 2,7263477sec, RG 912,. DW 41, 600usec, DE 6.00usec, TE 297.9K, D1 1.00sec, P1 10.90usec, SI 32768. DMSO-d6, or CDCl3 (Sigma–Aldrich, Bangalore, India) were used as solvents, and TMS as an internal standard. ESI-MS analyses were performed on a Waters Q-TOF Premier Mass Spectrometer (Micromass MS Technologies). Column chromatography separations were carried out on silica gel (60–120mesh; Merck). Preparative TLC was performed on silica gel (Merck, 200–300mesh). Precoated silica gel plates (Merck, Silica gel 60 F254) were used for analytical TLC visualized by exposure to iodine and UV radiations. STZ was obtained from Sigma–Aldrich chemicals (St. Louis, Missouri, USA). NA was obtained from Central Drug House (P) Ltd., New Delhi (India) and metformin was obtained from Franco–Indian Pharmaceuticals Pvt. Ltd., Mumbai, India. All other chemicals used were of analytical grade from S.D. Fine chemicals, Delhi, India. Elution of the column with chloroform–methanol (19:1) gave a pale yellow amorphous powder of 1, recrystallized from chloroform–methanol (1:1); Rf 0.35 (chloroform–methanol, 9:1); m.p. 265-267°C; UV λmax (MeOH): 207nm (log ε 4.1); FTIR (fourier transform infrared spectroscopy) υmax (KBr): 3391, 2919, 2850, 1735, 1639, 1538, 1465, 1378cm–1; 1H and 13C NMR (DMSO-d6): [Table 2]; ESI-MS m/z (rel. int. ): 664 [M]+ C38H64O9 (5), 316 (22), 163 (35), 143 (13), 124 (32). Elution of the column with chloroform–methanol (9:1) yielded a yellow powder of 2, recrystallized from acetone–methanol (1:1); Rf 0.72 (chloroform–methanol, 9:1); UV λmax (MeOH): 218nm (log ε 3.1); FTIR υmax (KBr): 3366, 2919, 2850, 1739, 1627, 1538, 1467, 1376, 1261, 1169cm–1; 1H and 13C NMR (DMSO-d6): [Table 2]; ESI-MS m/z (rel. int. ): 676 [M]+ C39H64O9 (4), 316 (17), 163 (14), 126 (22), 99 (19). Elution of the column with chloroform yielded a pale yellow waxy compound 4, recrystallized from chloroform; Rf 0.58 (benzene–chloroform–methanol, 5:4:1); IR υmax (KBr): 3438, 2928, 2854, 1641, 1445, 1382, 1215, 1072, 1019, 928, 932, 758 cm–1; 1H NMR (CDCl3): δ 6.13 (1H, d, J=5.6Hz, H-6), 5.86 (1H, d, J=5.6Hz, H-7), 3.81 (1H, dd, J=5.8, 8.9Hz, H-3α), 1.28 (3H, brs, Me-28), 1.25 (3H, brs, Me- 19), 1.16 (3H, d, J=6.1Hz, Me-21), 1.04 (3H, brs, Me-29), 0.82 (3H, d, J=6.6Hz, Me-26), 0.79 (3H, d, J=6.3Hz, Me-27), 0.75 (3H, brs, Me-18), 0.70 (3H, brs, Me-30), 0.65 (3H, s, Me-28); 13C NMR (CDCl3): δ 76.30 (C-3), 143.72 (C-5), 118.89 (C-6), 135.01 (C-7), 136.92 (C-8), 16.39 (C-18), 18.65 (C-19), 26.12 (C-21), 29.48 (C-26), 27.49 (C-27), 23.61 (C-28), 32.33 (C-29), 17.59 (C-30); ESI-MS m/z (rel. int. ): 426 [M]+ C30H50O (3). Elution of the column with chloroform–methanol (9:1) afforded a yellow amorphous powder of 5, recrystallized from chloroform–methanol (9:1); Rf 0.45 (chloroform–methanol, 1:1); UV λmax (MeOH): 211nm; IR υmax (KBr): 3425, 3390, 3260, 2957, 2850, 1644, 1445, 1377, 1161, 1074, 1028, 887 cm–1; 1H NMR (DMSO-d6): δ 5.22 (1H, m, H-6), 5.18 (1H, d, J=7.1Hz, H- 1'), 4.85 (1H, m, H-5'), 4.85 (1H, m, H- 5'), 4.40 (1H, dd, J=7.1, 8.0Hz, H-2'), 3.66 (1H, dd, J=5.5, 8.9Hz, H-3), 3.56 (1H, m, H- 3'), 3.43 (1H, m, H-4'), 3.12 (1H, d, J=10.5 Hz, H2-6'a), 3.09 (1H, d, J=10.3Hz, H2-6'b), 1.28 (3H, brs, Me-28), 1.20 (3H, brs, Me-19), 0.98 (3H, d, J=6.6Hz, Me-21), 0.95 (3H, brs, Me-29), 0.81 (3H, d, J=6.5Hz, Me-26), 0.78 (3H, d, J=6.4Hz, Me-27), 0.74 (3H, brs, Me-18), 0.51 (3H, brs, Me-30); 13C NMR (DMSO-d6): δ 76.27 (C-3), 42.19 (C-4), 148.23 (C-5), 118.42 (C-6), 57.36 (C-17), 15.61 (C-18), 22.52 (C-19), 23.73 (C-21), 25.71 (C-26), 26.03 (C-27), 21.77 (C-28), 29.48 (C-29), 18.22 (C-30), 103.61 (C-1'), 74.51 (C-2'), 68.76 (C-3'), 65.03 (C-4'), 76.17 (C-5'), 60.85 (C-6'); ESI-MS m/z (rel.int. ): 590 [M]+ C36H62O6 (2). STZ is a well known diabetogenic agent exerting cytotoxic action on pancreatic β-cells, whereas NA is given to partially protect these cells against STZ mimicking type 2 diabetes response., The results of subchronic administration of chloroform extracts of fruits of C. indica and M. balsamina for a week separately to diabetic rats are given in [Table 1]. It was observed that untreated diabetic rats showed a consistent increase in fasting blood glucose (FBG) when estimated over a week. The fruit extracts of C. indica and M. balsamina, each given orally daily for a week at a dose of 250mg/kg BW, showed a significant reduction in FBG (P<0.05 versus diabetic control) when estimated on the seventh day of treatment. Both the extracts not only prevented reduced elevated blood glucose but kept FBG of experimental animals to near basal level comparable to metformin (15mg/kg BW, p.o.). There was more significant decrease in FBG with metformin (P<0.01). [Figure 1] depicted the effect of oral glucose overload (2g/kg BW, p.o.) in diabetic rats pretreated with C. indica and M. balsamina fruit extracts (250mg/kg BW, p.o.) given daily for 7 days separately. The fruit extracts blunted the effect of glucose challenge as signified by about 25mg/dL increase in peak blood glucose level after 1h of glucose overload, compared with about 75mg/dL increment in diabetic control animals at the same time level. Both the extracts and metformin normalized blood glucose to basal level by the third hour of glucose challenge. [Figure 2] provides an easy visual comparison of the effect of extracts and metformin with respect to the area under the curve (AUC) in glucose overload-induced hyperglycemia. It is evident that both the fruit extracts produced a significant reduction in AUC comparable to metformin (P<0.01). Thus, the extracts of both the fruits produced significant blood glucose-lowering effect in experimental diabetic animals. 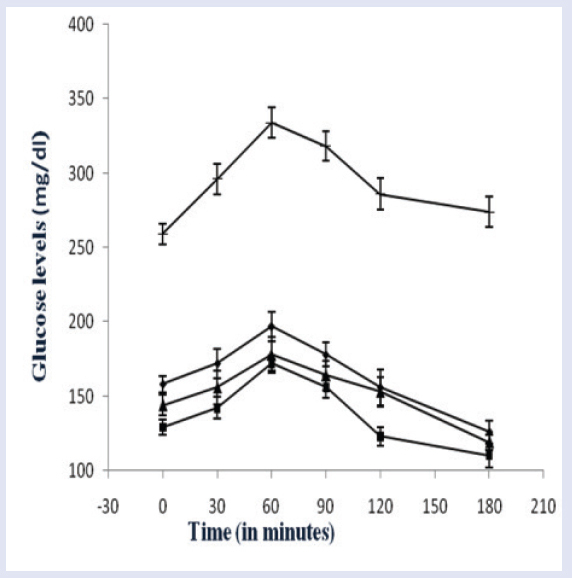 Figure 1: Effect on the glucose tolerance in mild diabetic rats after oral glucose overload. (▴) Diabetic control (1 mL/kg BW of 0.3% CMC in distilled water, p.o. ); (◼) pretreated with metformin (15 mg/kg BW, p.o.) for seven days; (♦) pretreated with chloroform extract of Coccinia indica fruits (250 mg/kg BW) for seven days; (▴) pretreated with chloroform extract of Momordica balsamina fruits. Values are expressed as of mean ± S.D. ; n = 5 in each group. Figure 2: Representation of area under the curve (AUC) of blood glucose levels after OGTT in STZ-NA-induced mild diabetic rats. DC: Diabetic control (1 mL/kg BW of 0.3% CMC in distilled water, p.o. ); CI: pretreated with chloroform extract of Coccinia indica fruits (250 mg/kg BW) for seven days; MB: pretreated with chloroform extract of Momordica balsamina fruits (250 mg/kg BW) for seven days; MF: pretreated with metformin (15 mg/kg BW, p.o.) for seven days. Values are expressed as of mean ± S.D. ; n = 5 in each group. **P < 0.01, significant versus DC. The bioactive extracts were subjected to column chromatography over silica to yield compounds 1-3 from C. indica and 4-6 from M. balsamina. The structures compounds [Figure 3] were elucidated on the basis of detailed spectroscopic data analysis. Figure 3: Chemical structures of compounds 1-6. Compound 1, was obtained as pale yellow amorphous powder from chloroform–methanol (19:1) eluants. Its FTIR spectrum exhibited absorption bands characteristic for hydroxyl group (3391 cm–1), ester group (1735 cm–1), and unsaturation (1639 cm–1). Its ESI MS displayed a molecular ion peak at m/z 664 consistent with the molecular formula C38H64O9 of a triterpenoid alglycosidic ester. The fragment ion peaks at m/z 163 [C6H11O5]+ supported the presence of a glucose unit in 1. The fragment ion peaks at m/z 124 (C9,10-C5,6 fission), 316 (C13,17-C14,15 fission), and 143 (C9H9O, side chain) suggested the presence of cucurbitane-type carbon framework along with a C9- side chain. Further evidence was provided by NMR (nuclear magnetic resonance) data [Table 2]. Signals at δH1.23 (6H, s, H3-26, H3-27) and δC 71.32 (C-25) indicated the presence of hydroxyl at C-25. A three-proton doublet at δH 0.84 (J=3.3Hz, H-24′) and a signal at δC 19.05 (C-24′) supported the presence of methyl substituent at C-24. A double-doublet at δH 2.34 (J = 4.6, 10.2 Hz) for H-10 and a slightly shielded signal at δC 36.18 for C-9 have been typically reported for cucurbitanes.,A double-doublet at δH 3.67 (J=5.1, 11.2Hz) was ascribed to H-3 carbinol proton placed in α-orientation on the basis of coupling constant. A singlet at δH 3.11 (3H) was assigned to methoxy protons. The downfield signals at δH 5.32 (dd, J=4.8, 9.4Hz, H-6), δC 141.06 (C-5), and 121.31 (C-6) and indicated a double bond between C5 and C6. The signals at δH 4.90 (d, J=6.3Hz) and δC 100.78 along with other signals for sugar protons and carbons in the respective spectra indicated the presence of a glucose unit attached to the cucurbitane unit. The COSY (correlation spectroscopy) NMR spectrum displayed an important cross peak between anomeric proton H-1′ and H-3. It also showed correlations between H-10 and H2-1; H-6 and H2-7; H-24 and H-24′; and H-20 and H3-21. The 1HNMR (hydrogen-1 nuclear magnetic resonance OR Proton nuclear magnetic resonance) spectrum also displayed four singlets at δH 0.87 (H3-18), 0.91 (H3-19), 0.99 (H3-28), and 0.74 (H3-29) along with a doublet at δH 0.98 (J=5.5Hz, H3-21) to account for the corresponding methyl protons. The 13CNMR = Carbon -13 nuclear magnetic resonance spectrum of 1 displayed signals for 38 carbons that were assigned unambiguously on the basis of chemical shift values and DEPT (distortionless enhancement by polarization transfer) experiments. It exhibited nine methyl carbons, 10 methylene carbons, 12 methine carbons (including six carbinol signals), and seven quaternary carbons. Importantly, the 13CNMR spectrum exhibited six signals between δC 70 and 80 for the carbinol carbons out of which the one at δC 71.32 disappeared in DEPT-135 experiment, suggesting the presence of a quaternary hydroxylated carbon (C-25). These findings and comparison of NMR spectra of 1 with those of known compounds,,, led us to formulate its structure as 3β, 25-dihydroxy-24-methyl-30-carboxy methyl cucurbita-5-en-3-O-β-d-glucopyranoside and was designated as coccinoside A. Compound 2 was obtained as yellow amorphous powder from chloroform-methanol (9:1) eluants. Its ESI mass spectrum displayed a molecular ion peak at m/z 676 consistent with the molecular formula C39H66O9. Its spectral data, as given in [Table 2], was similar to 1 except for the presence of an additional double bond and an ethyl substituent in the side-chain. This led us to formulate its structure as 3β, 25-dihydroxy-24-ethyl-30-carboxy methyl cucurbita-5, 22-dien-3-O-β-d-glucopyranoside and was designated as coccinoside B. Compound 3 was obtained as light brown amorphous powder from chloroform–methanol (9:1) eluants. Its IR spectrum displayed absorption bands for hydroxyl group (3411cm–1), ester group (1724cm–1), and unsaturation (1636cm–1). On the basis of mass and 13C NMR spectra, its molecular formula was established as C41H66O9 consistent with that of a triterpenoidalglycosidic ester. A diagnostic ion peak at m/z 182 [C12H12O]+ supported the presence of a hydroxybutyl substituted side chain in 3. The fragments ion peaks at m/z 123 (C9,10-C5,6 fission), 316 (C13,17-C14,15 fission), and 163 (glycosidic linkage fission) indicated a cucurbitane carbon framework linked to glucose unit. Further evidence in support of proposed structure were derived from NMR data [Table 2]. The signals at δH 1.27 (2H, m, H2-24′), 1.24 (4H, m, H2-25′, H2-26′), 4.23 (2H, d, J=9.8 Hz, H2-27′), and δc 31.81 (C-24′), 29.87 (C-25′, C-26′), 63.27 (C-27′) indicated the presence of a hydroxybutyl unit C-24 of the side-chain. Two one-proton doublets at δH5.44 (J=6.0HZ) and 4.89 (J=6.0Hz), and a two-proton doublet at δH4.80 (J=5.6 Hz) were ascribed correspondingly to H-6, H-7, H-22, and H-23 vinylic protons. Relatively lower values for coupling constants for vinylic protons (6.0 and 5.6Hz) indicated the cis-arrangement for H6/H8 and H22/H23. Four downfield signals at δC 140.89 (C-5, C-8), 121.72 (C-6, C-7), 135.65 (C-22), and 123.93 (C-23) supported the presence of double bonds between C5-C6, C7-C8 and C22-C23. A double-doublet at δH3.67 (J=4.1, 10.8HZ) was assigned to H-3 carbinol proton placed in α-orientation on the basis of coupling constant values. A sharp singlet at δH 3.16 was attributed to methoxy protons. The signals at δH5.04 (bd, J=12.1 Hz, H-1′) and δC101.18 (C-1′) along with other sugar protons and carbons in the respective spectra further supported the presence of a glucose attached to the cucurbitane unit. A signal at δH2.35 (m, H-10) and a slightly shielded signals at δC36.67 (C-9) and 45.11 (C-10) are characteristic to cucurbitanes as reported earlier., The 1HNMR spectrum also displayed five singlets at δH0.86 (H3-18), 0.94 (H3-19), 0.88 (H3-26, H3-27), 0.96 (H3-28), 0.76 (H3-29), and a doublet at δH0.91 (3H, J=6.3Hz, H3-21) for the methyl protons. 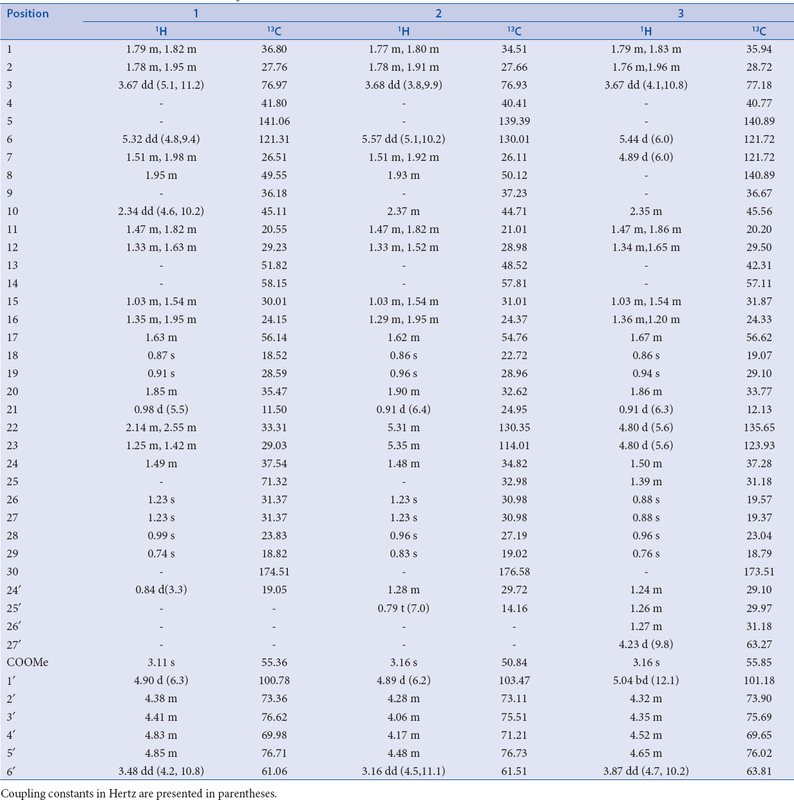 The 13C NMR spectrum 3 exhibited signals for 41 carbons that were assigned unambiguously on the basis of chemical shift values and DEPT experiment [Table 2]. It displayed eight methyl signals, 11 methylene signals, 15 methine carbons, and seven quaternary carbon signals. The important signals appeared for ester carbon at δC 173.51 (C-30), hydroxymethyl carbons at δC 63.27 (C-27′), 63.81 (C-6′), and methoxy carbon at δC 55.85. The data were compared with previous reports on cucurbitanes and were found to be in good agreement.,, Thus, the structure of 3 was determined as 3β-hydroxy-24-(1-butanol-4-yl)-30-carboxy methyl cucurbita-5, 7, 22-trien-3-O-β-d-glucopyranoside, and was designated as coccinoside C.
Compounds 4-6 were obtained from M. balsamina from chloroform and chloroform–methanol (9:1) eluants. Their spectral data were compared with previous reports on cucurbitanes and were found to be in good agreement.,,,, This led us to formulate their structures as cucurbit-5, 7-dien-3β-ol (4), cucurbita-5-en-3β-ol-3-O-β-d-glucopyranoside (5), and cucurbit-5-en-3β-ol-3-O-β-d-glucopyranosyl-(4′→1′′)-O-β-d-glucopyranoside (6). This is the first report of these cucurbitacins from these plants. Our study confirms the beneficial effects of C. indica and M. balsamina fruits in diabetes by lowering the elevated blood glucose level. The beneficial effect of these fruits could possibly be because of the constituents reported here. The study further supports their supplementation in the diet of newly detected diabetic patients for stricter glycemic control. The authors would like to express their gratitude to the Jamia Hamdard, New Delhi, India for providing infrastructures and other facilities.The author (Ujjwal Kaushik) is thankful to the Council for Scientific and Industrial Research, New Delhi, Government of India for financial assistance. Ananda PK, Kumarappan CT, Sunil C, Kalaichelvan VK. Effect of Biophytum sensitivum on streptozotocin and nicotinamide-induced diabetic rats. Asian Pac J Trop Biomed 2012;2:31-5. Lakey WC, Barnard K, Batch BC, Chiswell K, Tasneem A, Green JB. Are current clinical trials in diabetes addressing important issues in diabetes care? Diabetologia. 2013;56:1226-35. Knowler WC, Barrett-Connor E, Fowler SE, Hamman RF, Lachin JM, Walker EA, et al. Diabetes Prevention Program Research Group. Reduction in the incidence of type 2 diabetes with lifestyle intervention or metformin. N Engl J Med. 2002; 346:393-403. Kaushik U, Aeri V, Mir SR. Cucurbitacins: an insight into medicinal leads from nature. 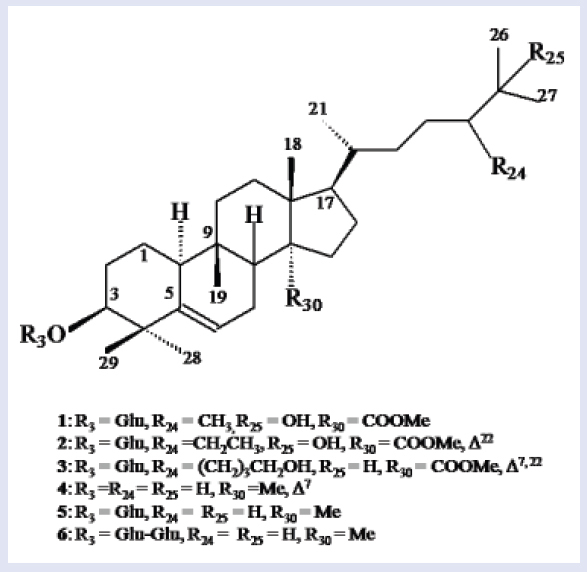 Pharmacog Rev 2015;9:12-18. Azad KK, Akhtar S, Mahtab H. Coccinia indica in the treatment of patients with diabetes mellitus. Bang Med Res Council Bull 1979;5:60-6. Kuriyan R, Rajendran R, Bantwal G, Kurpad AV. Effect of supplementation of Cocciniacordifolia extract on newly detected diabetic patients. Diabetes Care 2008;31:216-20. Bhakuni DS, Srivastava SN, Sharma VN, Kaul KN. Chemical examination of the fruits of Coccinia indica. J SciInd Res 1962;21B:237-38. Basu K, Ghosh BK. Chemical investigation of Coccinia indica. Transactions Bose Res Instt 1972;35:43-4. Kundu S, Ray AB. Chemical examination of Coccinia indica fruits. J Indian Chem Soc 1987;64:776-77. Vaishnav MM, Jain P, Jogi SR, Gupta KR. Coccinioside-K, triterpenoidsaponin from Coccinia indica. Oriental J Chem 2001;17:465-68. Vaishnav MM, Gupta KR. Ombuin-3-O-arabinofuranoside from Coccinia indica. Fitoterapia 1996;61:80. Kumar S, Sudheesh S, Vijaylakshmi NR. Hypoglycemic effect of Coccinia indica: mechanism of action. Planta Med 1993;59:330-32. Singh G, Gupta P, Rawat P, Puri A, Bhatia G, Maurya R. Antidyslipidemic activity of polyprenol from Cocciniagrandis in high-fat diet-fed hamster model. Phytomed 2007;14:792-98. Thakur GS, Bag M, Sanodiya BS, Bhadouriya P, Debnath M, Prasad GB. Momordica balsamina: a medicinal and neutraceutical plant for health care management. Curr Pharm Biotechnol 2009;10:667-82. Flyman MV, Afolayan AJ. Proximate and mineral composition of the leaves of Momordica balsamina L an under-utilised wild vegetable in Botswana. Int J Food Sci Nutr 2007;58:419-23. Karumi Y, Onyeyili PA, Ogugbuaja VO. Identification of active principles of Mormordica balsamina (Balsam Apple) leaf extract. J Med Sci 2004;4:179-82. Ramalhete C, Mansoor TA, Mulhovo S, Molnar J, Ferreira MJ. Cucurbitane-type triterpenoids from the African plant Momordica balsamina. J Nat Prod 2009;72:2009-13. Ramalhete C, Lopes D, Molnar J, Mulhovo S, Rosaria VE, Ferreira MU. New antimalarials with a triterpenic scaffold from Momordica balsamina. Biorg Med Chem 2010;18:5254-60. Ramalhete C, Lopes D, Molnar J, Mulhovo S, Rosaria VE, Ferreira MU. Karavilagenin C derivatives as antimalarials. Biorg Med Chem 2011;19:330-38. Masiello P, Broca C, Gross R, Roye M, Manteghetti M, Boggi U. Experimental NIDDM: development of a new model in adult rats administered streptozotocin and nicotinamide. Diabetes 998;47:224-29. Ananda PK, Kumarappan CT, Christudas S, Kalaichelvan VK. Effects of Biophytum sensitivum on streptozotocin and nicotinamide induced diabetic rats. Asian Pac J Trop Biomed 2012;2:31-5. Atsuo T, Akiko MY, Ryosuke N, Yuka S, Masayuki S. Hypoglycemic effects of antidiabetic drugs in streptozotocin-nicotinamide induced mildly diabetic and streptozotocin-induced severely diabetic rats. Basic Clin Pharmacol Toxicol 2008;103:560-68. Saravanan R, Pari L. Succinic acid monoethyl ester prevents oxidative stress in sterptozotocin-nicotinamide induced type-2 diabetic rats. J Basic Clin Physiol Pharmacol 2006;17:115-32. Xu R, Fazio GC, Matsuda SPT. On the origins of triterpenoid skeletal diversity. Phytochem 2004;65:261-91. Chen JC, Tian RR, Qiu MH, Lu L, Zheng YT, Zhang ZQ. Trinorcucurbitane and cucurbitanetriterpenoids from the roots of Momordicacharantia. Phytochem 2008;69:1043-48. Chen JC, Liu WQ, Lu L, Qiu MH, Zheng YT, Yang LM. Cucurbitanetriterpenoids from Momordicacharantia. Phytochem 2009;70:133-40. Chang CI, Chen CR, Liao YW, Cheng HL, Chen YC, Chou CH. Cucurbitane-type triterpenoids from Momordica charantia. J Nat Prod 2006;69:1168-71.